As much as Hong Sang-soo’s latest film The Day After features people in conversation, hardly does a movie ever capture how alone people really are so powerfully. The four characters in the latest of three movies released in the U.S. this year by the Korean writer-director talk past each other often or misunderstand situations while betraying their own impulses with a rationalization that undermines gut feelings for false hopes. 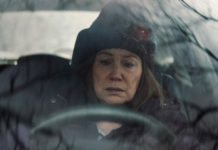 Still, the film reveals connections that are almost psychic between the characters, as honesty swirls below superficial attempts of deception to themselves and others. What results is an occasionally funny sometimes tragic drama of self-sabotage told out of sequence to get to a truth that would not be so apparent had this movie been allowed to unfold in exact chronology. In the case of Bongwan, a sort of pathetic melancholia weighs him down, which is overtly captured during a couple of crying fits. Clues that this film is much more than a straight narrative arrive early, following a confrontation over a meal that opens the film where Haejoo plainly asks Bongwan if he is having an affair. Though she makes some astute observations like his leaving to work extra early and losing weight — “It’s weird,” she says — he never answers her directly. He just lets out a small laugh and continues eating, a silence that speaks volumes. As he walks out of his condo in the dark of morning he strolls below an unobtrusive, hardly present metal archway. Walking into the empty, predawn street the wife’s disembodied voice calls out “Honey!” He turns around to no one. It’s so quick it feels phantasmagoric. In a scene right after he walks back through the archway, drunk and in the arms of Chang-sook, who professes her love to him. Soon after, he is jogging alone in that same dark street and sits in an empty playground to cry. It eventually becomes apparent that Bongwan and Chang-sook are just a pair of knuckleheads who probably got involved after sharing too much soju during lunch breaks. The relationship, though it seems to unravel Bongwan, is immaterial to the presentation of how these people relate to one another. When Bongwan hires Areum, a month after the affair, it seems Bongwan is up to his old ways. However, she, as he says over lunch, is much smarter than he initially thinks. During a philosophical discussion at lunch, she explains her take on the illusion of reality, and he, a critic whose writing she says she very much respects, responds by saying, “I guess you do know something. You are much smarter than I thought.” As much as this film is about the bumbling fornicator Bongwan, it also elevates the modest philosopher Areum, a person more content with her individuality and solitariness than anyone else in the film. When he asks her what she believes, she responds, “I’m not a leading character, and I can die at any time, and everything is OK and beautiful.” She still has something to learn, as she later comes to regret leaving out God’s role in that equation, fearing judgement from an intellectual like Bongwan. Hong owes a lot to films of the French New Wave, in particular Eric Rohmer. On a superficial level, The Day After feels more like a French New Wave film above Hong’s two other films released this year because it is shot in black and white and with its extended scenes of conversations, which are often presented in continuous takes, only granted a semblance of visual pacing with the spare use of pans and zooms. The film in particular recalls Rohmer’s 1969 movie My Night at Maud’s, as there are moments where spirituality and relationships come up in conversation as noted in Areum’s spirituality. Those familiar with Hong’s work won’t necessarily find anything new here, but it does capture a light-footed compendium of the director’s concern, which shows an ease in humor while dealing with heavy themes within a framework of narrative structure that benefits from its rejection of chronology as being a definitive form to justly capture those themes. Most fans will feel the film is minor Hong, but it’s certainly more profound than most relationship dramas you will see in the multiplex. The Day After runs 92 minutes, is in Korean with English subtitles and is not rated. It is now playing in our South Florida area exclusively at the Miami Beach Cinematheque. For screenings in other parts of the U.S., visit the film’s official website and look for “playdates.” The Cinema Guild shared an online screener link for the purpose of this review.